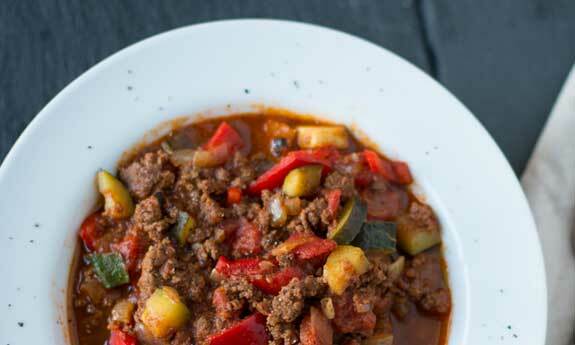 Chili and Paleo work extremely well together because it’s a great way to mix a lot of meat with a lot of vegetables. The biggest change up to a traditional chili recipe is getting the beans out because there’s no legumes when eating Paleo. 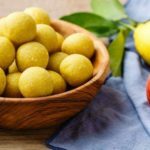 We’ve located some of the tastiest chilis out there that are constructing using the Paleo ideology, so you can enjoy these and not worry if you are following plan or not. If you like your chili chunky this is your recipe. It looks like they cut up the ingredients with a primitive knife. 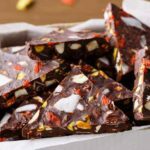 They’re big bold chunks of food that will give your mouth something to work on, and you’ll be able to taste each ingredient individually. This is not such a bad thing with ingredients like avocado, zucchini, carrots, and tomatoes. This recipe shows you how to take leftovers and make them new again, so you don’t have to reinvent the wheel. It’s all about doctoring it up so that it looks appetizing again. Organ meats are definitely approved on the Paleo diet, since they represent something a caveman wouldn’t have turned their nose up. It uses beef as well as liver so it’s just like you’re just eating liver chili. The use of raspberries is also encouraged, and this recipe is great at using plenty of Paleo inspired vegetables and ingredients so you can enjoy this chili with no regrets or guilty feelings afterward. As an added bonus it all gets cooked in the Crock Pot, so it’s a relatively easy and hands off way to make yourself a satisfying meal. 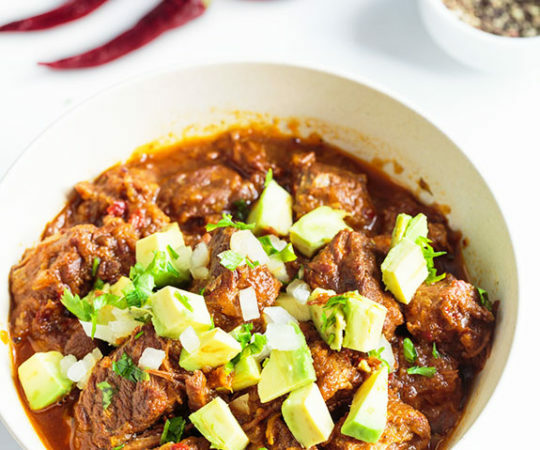 Here’s a Paleo chili that uses chicken, one of the most popular meats for Paleo followers. It has you using bone-in chicken, which tastes great in chili form. 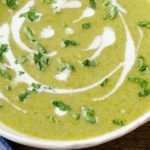 The verde means it’s going to have a bit of green hue when you’re done, and that’s thanks to several green ingredients including celery, green peppers, salsa verde, and avocado used as a topper. 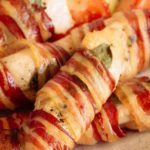 The great part of this recipe is that it has a bit of a kick, so you’re not starved for flavor, and it has a nice mix of both meat and vegetable, the way Paleo is supposed to be. Turkey can seem like a real meaty meat in ground form, and that’s just what’s being used here. They are piling on the turkey and cilantro to live up to the title, and this chili is packing some heat. Peppers of all kinds are totally Paleo, so you can eat as many as you want, and the fiery kind will wake up your tongue and potentially singe your taste buds. Here the poblano pepper is rather mild, and the spiciness will come from the jalapeno pepper, so it won’t be too hot, not like other chilis that bring in the habanero. Overall you get a very edible chili with ingredients that pass through the Paleo filter. The nice thing about chili and chili recipes is that you can control how much spice you add during the cooking process. Fire it up if you like things hot, or keep it mellow if you just want to enjoy the different flavors it contains. This is a nice recipe to have on file because it allows you to make chili without using any chili powder. That’s pretty impressive, because chili powder is typically what gives chili its distinctive taste. But they’ve figured out how to do it, and they’re using ground beef as the obligatory meat portion of the meal. We like the idea of only spending 10 minutes on a meal, because that sure brings us back to our roots. The idea of spending up to an hour preparing and cooking a meal is a little much, and this one even promises that you won’t have to chop up any of the ingredients. That’s like a double bonus. What you get is a thick, meaty, easy chili that doesn’t get the benefit of hours of simmering, but seems to do alright without it. The perfect meal to whip up and put down without a lot of fuss. Here’s an Italian-inspired chili that you get to make in the Crock Pot so that you don’t have to spend a bunch of time stirring and babysitting the chili. 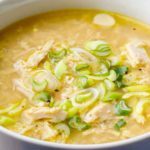 It has a nice list of Paleo-friendly ingredients so that you can get massive amounts of flavor in one meal that has no cheats to it. The ingredients include such items like fire roasted tomatoes, basil, capers, and bay leaves. You are definitely not going to call this bland. They serve this up with diced avocado as a topper. Good idea since you’ll get fiber to help it all go through your system. This chili lives up to its name and is very colorful when you’re finished. That’s one thing about the Paleo diet that many do not understand. It does use a lot of different vegetables and isn’t just about eating piles of meat. In order to pull off all these colors she’s using plenty of tomatoes, some bell peppers, and celery, and there are heaps of other ingredients you would expect from chili. But of course there’s no beans in here because they’re just not allowed. The hot sauce comes in at the end, and she’s using Frank’s Red Hot, a darn good and classic tasting hot sauce. Mixing two different meats might not have been something that Paleo man would have done, but it ends up in a lot of Paleo recipes. It does add to the taste and texture of the chili, and two meats are better than one in the flavor department. Here she’s got the standard ground beef, but is adding cubes of stew meat to make this extra meaty, and give your mouth something to chew on. She’s also using organic items when possible, like the organic beef broth. It’s important to go as natural as you can on the Paleo Diet. The other chili recipes on this page might want to call shenanigans on this recipe because she’s using the secret weapon of bacon to seal the deal. Bacon is used in plenty of Paleo recipes a) because it’s an authorized food b) because it makes things taste good. 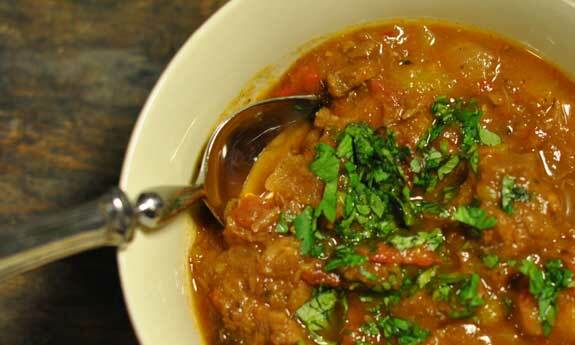 In chili it’s going to give additional meaty flavor, and that traditional bacony smokiness. This recipe is short on ingredients, so you won’t have to buy too much at the store, and won’t have to fuss too much with things in order to pull off a delicious and satisfying meal. Sweet dumplings might look a bit like pumpkins, but they don’t taste like it, they taste more like squash. But you won’t really notice their flavor too much because they’ve spiced this up pretty good with the use of chipotle chile. But the texture will remain, as well as some sweetness, so this won’t be an inferno like some chilis are known for. 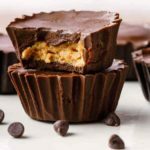 There are a lot of great ingredients in use here, all Paleo a-go-go so so you don’t have to have any reservations about eating it. Going Paleo is less about worrying about cheating or falling off the wagon and more about keeping things simple and natural and cutting out the 21st century gunk that passes as food. Even though the author of this recipe doesn’t want to call it chili, if it looks liike chli and tastes like chili, we think it’s chili. The combination of sweet and spicy is always a winner, and bringing it to a chili recipe is super smart. Sweet bell peppers help with the sweetness, and the chipotle peppers will give it the spice it needs. The spices and seasonings are going to make this taste like chili, so it’s not going to be like you’re eating a random soup or stew. All of the ingredients are very natural and Paleo-OK.
We like easy recipes because early man would have kept things simple. They wouldn’t have used 15 different spices and spent a ton of time preparing the food. They would have done the bare minimum to make the food edible and then dug in. With less than 10 total ingredients they are keeping this relatively in check, and with a 10 minute prep time and 35 minute total cook time this goes from being nothing at all to being on the table in short order. 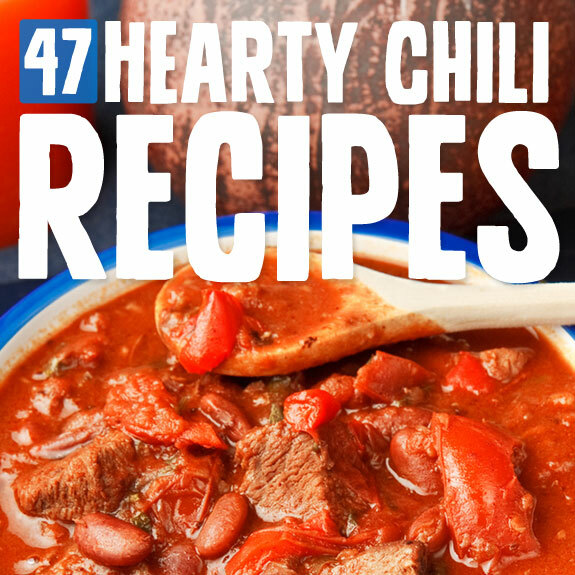 While it may be easy, all of the proper ingredients are in place for a delicious chili flavor. What do you do when it’s a snow day and you don’t know what to feed the family? Make a chunky batch of chili so everyone can stay warm and satisfied. Bacon, beef, and pork star in this 3 meat creation, so you’re definitely not going to be short on protein. 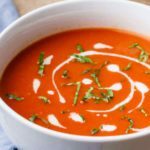 Aside from the tomatoes there aren’t too many vegetables in this, it’s a pretty meat-centric offering, which is fine to have sometimes on Paleo, but you’re looking for a half and half split for best results. But again, the tomatoes balance it out nicely, and this should give you hours of energy for snow shoveling or any other chores that need doing. This recipe hits the nail on the head by using a vegetable as a main ingredient, but also loading things up with meat. This is the meat:veggie ratio that you want to look for, as the pumpkin is going to provide the fiber necessary to whisk this meal through your digestive system, and the meat is going to give you the protein you need for sustained energy and feelings of satiation long after you’ve finished the meal. When preparing the pumpkin be sure to set aside the seeds as these are one of the Paleo approved seeds due to their nutritional makeup and you can make a snack out of them later. This title is a little ambiguous, since Paleo followers are encouraged to eat big game, but they’re referring to a sporting event in which two teams are trying to win an important title. They’re using grass-fed ground beef as the meat portion of this recipe, so no hunting skills required on this one. There is also a ton of vegetables being used, so you don’t have to worry that the balance is skewed. This is one chili that you won’t mind serving to guests over for the Big Game, and aside from having no beans in it they might not even know it’s a special chili recipe. Using fennel and shiitake mushrooms as two thirds of the bulk of the ingredients is a good way to start this Paleo chili off right. But don’t fear, there is a whopping 3 pounds of ground turkey being used, so it’s going to be meaty as can be. Paleo is not about eating red meat all the time, although red meat is not frowned upon. You want to eat a diverse range of foods both a variety of vegetables and a variety of meat. Paleo man did not thrive on one meat or one vegetable, but on whatever was nearby on any given day. Eating the same thing day in and day out is the hallmark of Neolithic and modern man. 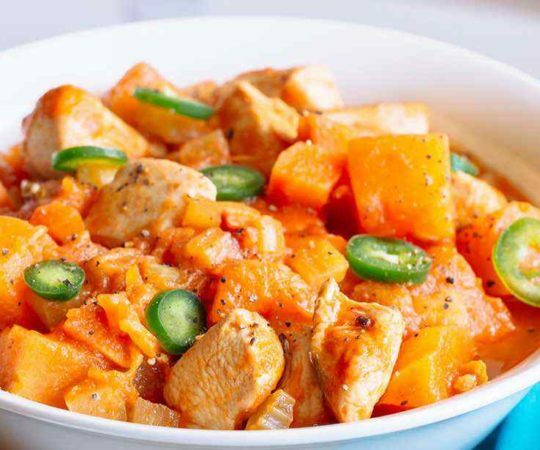 In less than an hour you can have a delicious pumpkin chicken chili. Even though there’s a bowl of rice pictured, it’s stated in the recipe that it was cooked especially for a friend that was carb-loading for a race. With the ingredients in this chili you won’t need anything else to fill you up, especially not rice. The pumpkin will provide the much-needed fiber that you aren’t getting from the chicken, and there are also some peppers and onions for more veggie flavoring. This is a bit on the spicy side thanks to jalapenos, but it manages to not be overbearing. 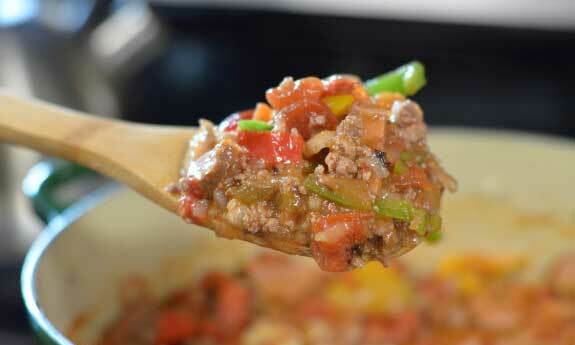 The colors of the rainbow is the theme for this Paleo friendly chili. Anytime you use so many wonderful colors you’re going to get a nice nutritional profile from a meal. There are many antioxidants residing in those bright colors. But don’t be fooled as this is no vegetarian fare, you’ll be getting a full load of meaty goodness, and with the spices added you’ll be getting a bit of heat with each bite. Thank the chipotles for that spiciness, since it will get hot but not so hot as to make you cry or lose feeling in your tongue. Venison is one of the most Paleo friendly meats because it’s going to be better than organic from not having been kept as livestock. The deer are able to roam and eat food that appeals to them naturally. The meat may be a little tougher, but since you are slowly cooking it until tender this is one of the best ways to enjoy it. 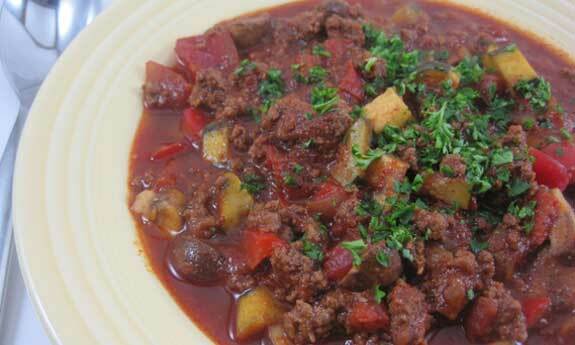 After having a bowl of venison chili you might not want to go back to beef, chicken, or turkey. The use of butternut squash is awesome because you’re always trying to match your meat intake with veggies. Anything with elk in it is going to be Paleo, because let’s face it there aren’t too many elk farms across the country. You’ll likely have to visit your local wild game supplier here, or they give you an out and say that you can sub in ground beef as a replacement. In addition to the meat they’ve included plenty of veggies like zucchini, peppers, onions, and two types of tomatoes so this is getting several points for its nutritional stack. There are also a bunch of seasonings and spices included, so this will be a taste sensation. You don’t have to be a Cajun chef in order to make this cajun-infused chili because the Cajun seasonings come from a bottle. They are using stew meat here, which usually makes for a chunkier chili, one where you’ve got good mouthfuls of beef to chew through. Some prefer this over the ground meats often used in chili that has a more consistent texture. There is a nice ensemble of vegetables being used, and this takes its sweet time in the slow cooker so it’s not one of those chilis that you have to keep stirring every few minutes. 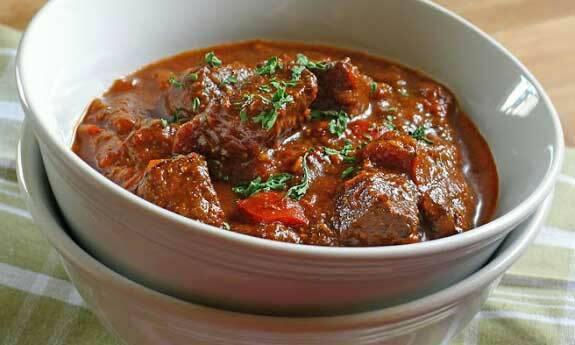 The use of grass-fed ground beef is a tip off that they’re making a Paleo chili recipe for you. Grass fed makes a huge difference because it’s going to mean that these cows weren’t subjected to the grain that is fed other cows. Cows wouldn’t naturally be eating grains if they were left to their own devices, so feeding them grass takes them back to their ancestry as well. They take the luxury of using bacon fat, since fats are authorized on the Paleo diet. There’s also a peculiar ingredient in here that we haven’t seen in a chili recipe before: 100% pure cacao powder. 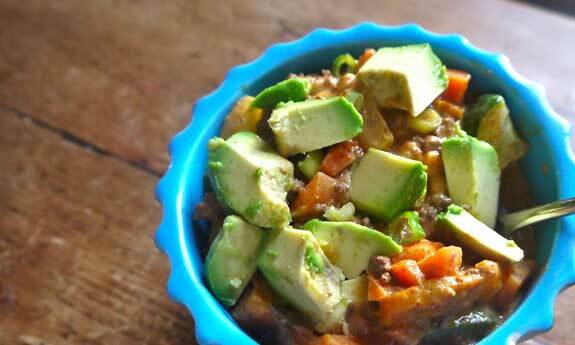 Like many Paleo chili concoctions this one is not shy about using fat. You may have been bombarded in the past with chili recipes that tried to cut out the fat, to make things leaner, to even leave out the meat. Here they are making sure there is plenty of fat in it, and letting you choose which fat you want to use. The mix of ground sirloin and ground pork is going to give you a nice depth to the savory flavor of the meal, and they are not forgetting that primal man also ate a hefty amount of vegetables, so there’s plenty included here. Using a Crock Pot makes this an easy chili to get on board with. They are using lean ground turkey, so you’ll get the meaty flavor, but it would serve as a break from beef if you’ve been eating a lot of that lately. 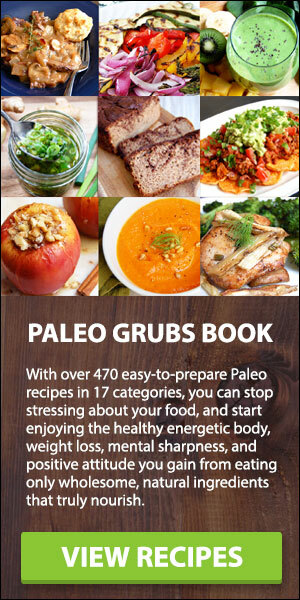 The standard recipe calls for beans, but they quickly note that Paleo followers can opt out of the beans without it making a huge difference to the final product. 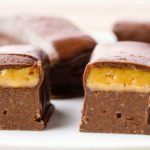 Beans and legumes are no-nos on the Paleo plan so you’d want to leave them out and stick to the other ingredients only. Here’s a great tasting and great looking chili that you can cook up anytime you get the chili craving. They’re using a London Broil which is nicely marbled, so you’re getting a good supply of fat, which let’s face it, it makes the chili taste better. 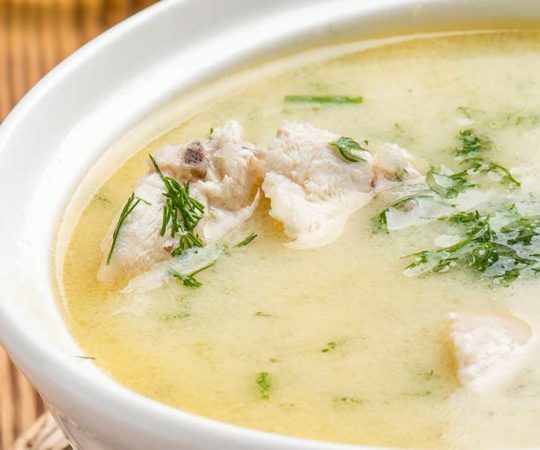 There are plenty of Paleo-approved foods in this recipe, but skip the cornmeal if you want to be totally in line with the Paleo eating plan. It’s a subject of some debate, and best passed on. You don’t see lamb being used as a chili meat too often, and that was the first thing that caught our eye on this one. You also don’t see olives featured too prominently in a chili recipe, so this has two bold ingredients in one chili, and advertises them in the title. So it’s interesting to see how they play off each other and the rest of the ingredients used here. The finished product seems very chili-like and has some visible vegetables like zucchini and tomatoes. This was a tongue in cheek titled chili because they were on their way to a Mayan end of the world party. Lucky for use the world didn’t end back then and we can still enjoy this chili, made out of deer meat. Venison will likely factor more into your diet than it did before, and the nice part about our society today is that you don’t have to rely on your hunting skills to get it, you can simply order it from your local wild game supplier. They’ll happily obtain the deer and sell it to you in much the same fashion that you can buy beef from the store without killing the cow. 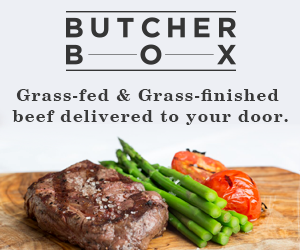 Bison is often brought up in health food circles as being a healthier alternative to beef. But that is not our concern here, as beef is totally acceptable and an encouraged meat on the Paleo path. But from a caveman or primal point of view a buffalo or bison is going to be a better fit than a domesticated cow, even one that is grass fed and led an organic lifestyle. With that in mind this is a great chili for a few reasons, not least of which is that it is incorporating masala flavoring into the mix. This is adding an Indian element to it that just plain works. If you used to enjoy your chili over rice, this is a recipe that will help you get the look and texture down, without having to resort to eating rice. While some Paleo practitioners say that rice is OK, most avoid it on the Paleo diet because of the complex cultivation required. 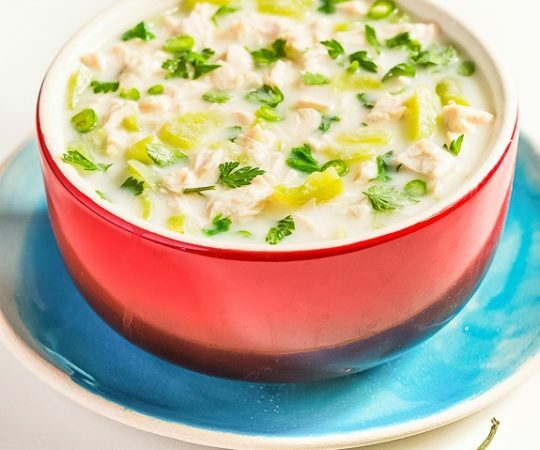 This is using cauliflower as the rice doppelganger, so you will be getting the nutritional benefits of this cruciferous vegetable that is a recommended veggie while eating Paleo. The chili comes out thick and chunky and delicious, and this is a complete meal. What’s really nice about this recipe is that the vegetable is built right in. You’re eating this out of a squash, so there’s not a way to wiggle out of eating your vegetables on this one. There’s a bunch of meat in the form of ground beef, and there are some jalapenos used to kick up the heat a bit, but not too much. The are some sweet potatoes used in this, so you’ll get a fiber boost for sure between the sweet potatoes and squash. They say Texans know their chili, and this recipe is out to prove that correct. The dark color of this chili means you’re in for some serious flavor, and part of that comes from the use of bacon, which is going to give it that flavor that only bacon can provide. The guajillo chiles and ancho chiles are going to add some nice flavor and some spice, but not a whole lot, and the real heat is going to come from the chipotle peppers. There is the phenomenon when these different peppers are combined together. It’s almost like a Voltron effect where they come together to form one big heat. Good luck with this one. When they say classic, they mean it. This is about as classic as you can get, and the if they added some beans to it it would be the sort of chili everyone thinks about when they think of chili. But since beans are your major stumbling block when it comes to eating purely traditional chili, this is perfect for swapping out a Paleo approved version for one that isn’t. The use of a slow cooker makes this caveman easy so you can go knock out your modern day duties and come back to a fully cooked meal. How to make Cincinnati chili, which is typically served over noodles and topped with copious amounts of cheese, when you’re not supposed to eat noodles or cheese? Well, forget about the cheese for starters, and then replace the spaghetti with spaghetti squash and you’re all set. You get the added bonus of the noodles providing the benefits of a vegetable rather than weighing you down like a pile of pasta does. They even manage to put some kale on the top of this, so you get phytonutrients to boot. You’ve got to give them points for presentation here, as they’re actually serving this inside of the pumpkin. This means you can use your spoon to carve out the innards of the pumpkin as you go along and get all of the fiber and nutrients from it. The insides are slow cooked, and they’re using plenty of healthy foods including kale, so you’re getting topped up on all of your vitamins in one go. And meat? They’ve got you covered with three pounds of pork so no worries. 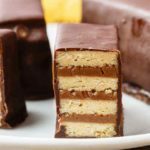 You’re really going to like this recipe because they have added a few special ingredients. 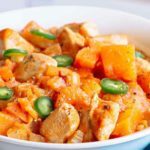 The first one that you’ll see is chorizo chicken sausage, which by itself is enough to make this a top three contender for tastiest Paleo chili on this page. Not to be outdone they went and added bacon to this bad boy so there’s no shortage of flavor and spiciness. The chipotle pepper and cayenne pepper can be adjust to taste, so make sure you’re tasting this as you go along to see how far down the spice rabbit hole you want to go. Chili mac is so yummy because the texture of the macaroni complements the texture of the meat so well. But what to do when the mac in chili mac becomes off limits? Here they’re replacing it with spaghetti squash, which doesn’t quite give you the same experience, but it comes close and allows you to stay Paleo so this is a good recipe to keep handy for days when you want this nostalgic throwback. A pound of beef or bison gets your meat quota filled, and plenty of peppers and spices fall in line as well. 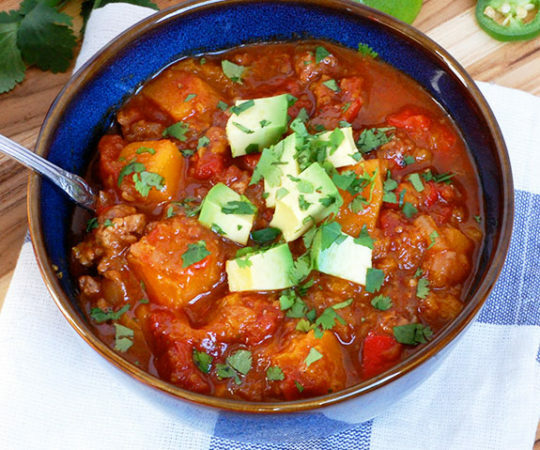 Even though this is just titled as sweet potato chili, don’t worry you’re getting plenty of meat in the way of ground pork. With pork try to opt for organic if you can to make sure that it’s going to be as clean as can be. They’ve added sausage to the fray here, so you’ll have a bunch of meaty pieces to chew through. The sweet potato is going to work to balance the equation, give you some nutrients, and give you some fiber to help it all along. If you’re not used to cooking with poblano peppers, this is a great recipe to start on. This is because there’s plenty of room for error, and if you put too much or too little you can adjust it later. These peppers are not the hottest around, and they don’t measure up to the kind of heat that jalapenos or chipotles generate. Still they’re spicer than bell peppers of course. 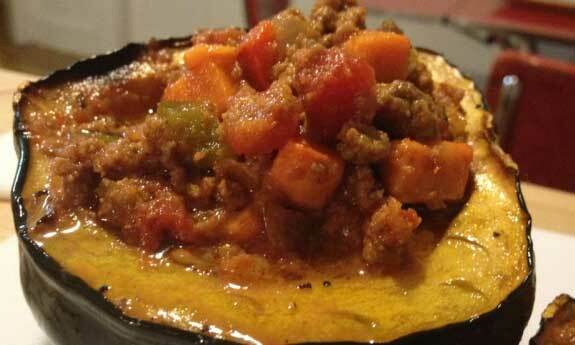 There is plenty of ground beef in this to keep you feeling full, and the pumpkin helps in this regard as well. Because of the sweetness of the pineapple this is going to be a spicy and sweet mix you won’t soon forget. And since pineapple is a Paleo approved fruit you don’t have to worry about eating it. This recipe doesn’t use so much pineapple that you’ll be getting too much sugar. Plus it’s balanced out with bacon and ground beef, so you are getting just as much savory flavor as you are sweet and spicy. The spiciness comes from jalapeno peppers so you will know you are having some chili when you eat this. Chipotles are going to deliver the heat here, and the cherry will do a bit to calm things down with a little sweet. The use of pork makes this one meal you will likely have again if you have it once. They use two different cuts of pork on this one, and you might ask why since most recipes just rely on a pile of ground meat to get the job done. When you use two different cuts of meat you are producing two different textures, where the ground pork will simply melt away as you chew it, the cubed pork shoulder is going to give your teeth something to gnaw on, just a bit because it will be cooked until tender. You can’t go wrong with this bison and sweet potato combination. The bison is going to give you a lean and tender meat, and still pile on the protein. The sweet potato is going to provide a nice texture to the meal, and give you fiber, vitamins, and minerals that your body needs and isn’t going to get from meat alone. There are simply a ton of vegetables that go into this, so it does a good job of following the Paleo line of thinking where you want your plate, or bowl in this instance, to be half meat and half vegetables. Chili needed a re-do and that’s what they’ve done here for you. Get the beans out of there and get any signs of dairy out too. Most chili comes rife with beans of all kinds, and gets topped with sour cream and cheese. Ax all of that here and bring on the meat and vegetables and classic chili seasoning so you satisfy the craving. 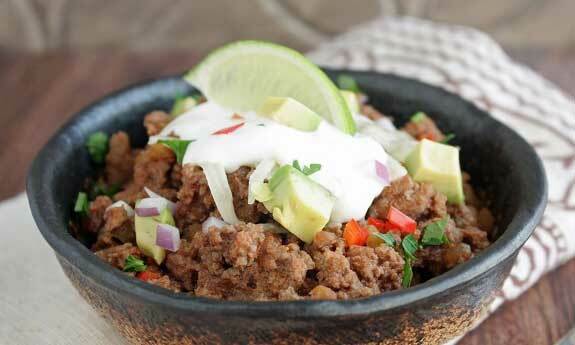 The end result is a big and bulky chili that won’t leave you feeling big and bulky. Try lean and mean, caveman style. Here’s an interesting use of coffee, put it in your chili. They must have a lot of free time in college these days because they figured out this recipe in between classes. Maybe they use this chili as a way to stay up and cram for tests. Whatever the case, you can cut out the coffee completely if you’re not touching the stuff while doing Paleo. It’s not as if early man had ground coffee beans on hand, or even had the idea to start using them to make coffee. All of the other ingredients in play here are solid, and this is a great go-to recipe. 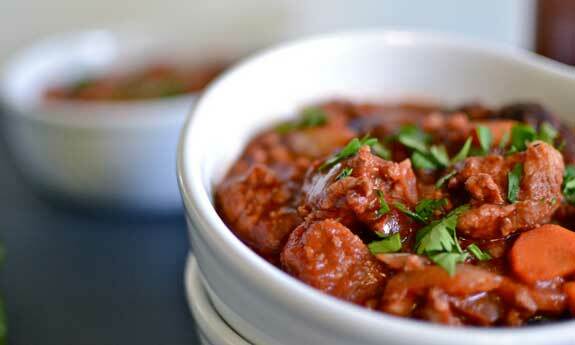 Chili con carne is pretty much Spanish for chili gone Paleo. That’s because the emphasis is on the meat, and not so much the beans or anything else for that matter. They’ve managed to sneak in an onion, but the rest is just big chunks of beef and tons of peppers and spices. This should provide you with a nice thick and meaty chili, but don’t forget to get your veggies as well, if not in this meal than in your other meals for the day. Early man did not live on meat alone, and it’s just so easy to add vegetables to a chili, since they get lost in all of the meats, spices, and seasonings. Oh boy would this recipe go over well with the Super Bowl crowd. They use sirloin steaks in addition to ground beef, and some say that no chili is complete unless it uses two types of meat like this. You really will notice the difference because the ground beef is simply going to serve as a backdrop to the steak. Pile in some nitrate-free sausage and you are pretty much pushing the limits of your taste buds. The fire roasted tomatoes and onions are a valiant effort at bringing some veggies to the party. Here’s a recipe when you don’t know what to do with leftover turkey and you want to make something delicious with it. Of course you may have to add some pumpkin to it to pull off this one, but it’s so worth it when you get a big pot of delicious chili out of the deal. 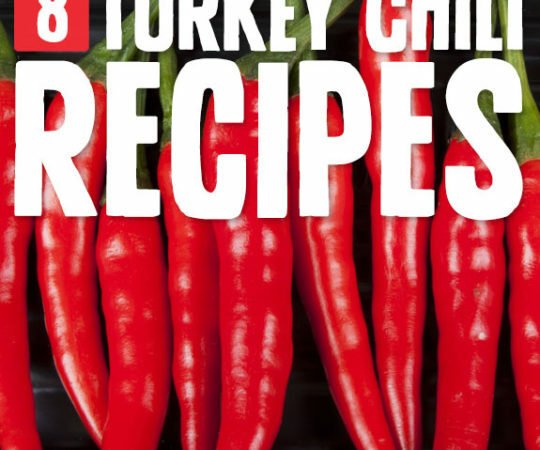 Turkey makes a great meat for chili, even though it’s not as popular as beef or chicken. And pumpkin works well to thicken up the chili and give you some fiber to help it all work its way through your system. A must have recipe for the holiday season. Thanks so much for including me in the chili roundup. :) great site you have here! That one is an older post (with bad photos, lol). Should take new pics with better camera. Aww man, all of these look so great. They’re all so different! Thanks for including my End of the World Venison Chili recipe.